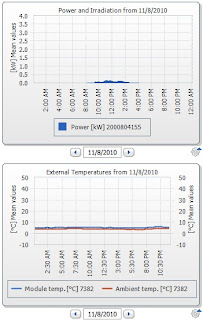 Monday 8 Nov '10: For the first time this year, the combination of weather was such that the Sunboxes did not operate at all. Am I unhappy? No! This is how it should be! It was a day of heavy cloud and continuous rain, temperature level at about 4-5º all day, and only 0.40 kWh of PV in the whole day - the worst of the half year so far. There is enough heat accumulated deep in the ground that the GSHP never lowered the outgoing temperature of its ground loop enough to have a delta T that would activate the sunboxes - this would have to be down to zero, but the ground is still 11º. This is actually a very good sign. I shall have to get used to more of these days - when its raining all day, and not particularly cold. We had a rainy week last week, but a sunny weekend with 31kWh buried on Sat and Sun. I did a deep ground temperature test on Sunday night and the deep ground was 11.7º after midnight. Exactly this time last year the deep ground was 9.2º. That is a significant difference for such a large earth mass, considering also that we have already had more wintry days this autumn. Last year, the winter didn't really get going till December. 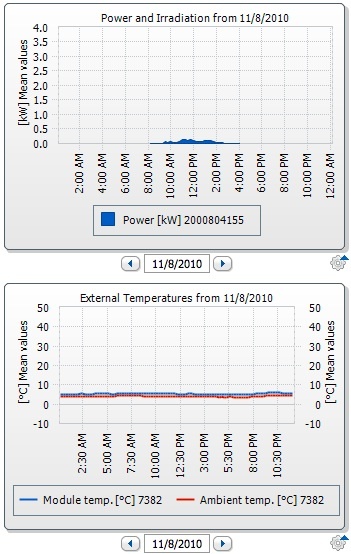 The GSHP is using less energy in days of similar outdoor temperature than in the previous year. So that's good. Tuesday Postscript: The morning was cloudy bright, with cold ambient air of about 6º and the GSHP sleeping (because its work was done). The sunboxes were at 28.5º, circulating glycol into the ground at 17.5º. Hmmm... that's good too! By the way, I've ordered more aluminium for side mirrors. No harm in giving it a try. These ones (illustrated) for the centre space between the sunboxes will divert midday sunlight sideways into the boxes instead of warming the wall between. It will also extend the life of the insulation that connects black panels 2 and 3 by providing a complete aluminium sheath over the pipe. I will probably extend it up to enclose the feed pipes that come in from above.